I'm looking to cut a pocket into the side of a part. The side is actually two surfaces at an angle to each other with a fillet rad between them. Merge all the surfaces you want to offset from prior to the extruded cut operation. Cool I think it worked, or at least something worked. I knitted the three surfaces together and selected that as the offset from surface of the extrude cut. I did have to hide the knitted surface as it created a separate "skin" which didn't actually cut but underneath was the "real" model with the pocket now in it. The settings seem the same as one the side that worked, any ideas? See attached screen shot. 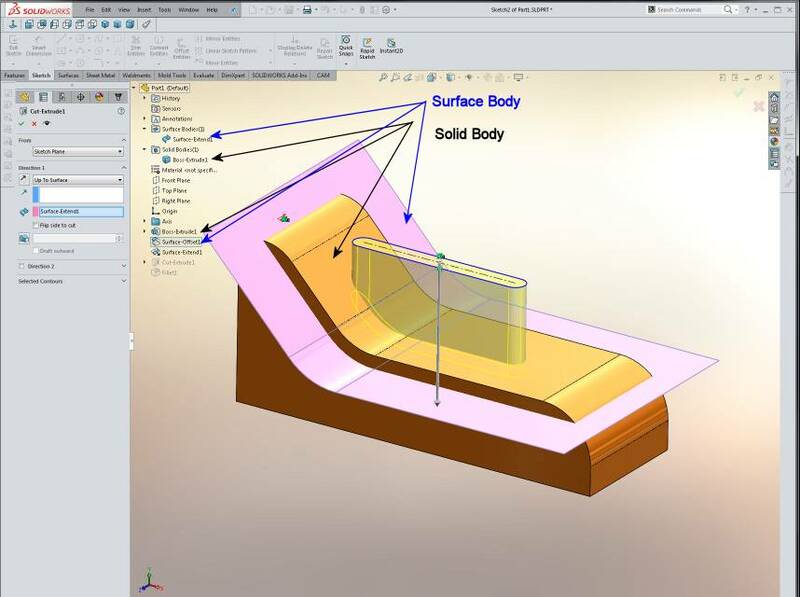 This is SW2016 so your screen might look a little different, but not much. SW is a hybrid modeller and does both solid and surface modeling. I used both in this example. 1) Create solid model of basic part. 3) Use the surface offset command to create a surface at your desired depth of cut. 4) Use the solid extruded cut command with the up to surface option. Pay attention to the upper part of the feature manager tree and notice there are two bodies in the model: one is the main "solid" body and the other is the "surface" body. If I were to continue work on the model, I would hide the surface to get it out of the way. It wouldn't let me select the new surface until I extended it (as I see in your image) and then it accepted the extended surface as the "up-to"
That's a really cool solution Colin, and thanks for sharing.